Sunday’s Aiken, S.C. Standard carried a story about Grace Taylor, the daughter of Dan and Lynn Taylor, all members of the Grace Brethren Church of Aiken. Grace is a member of the University of Georgia women’s gymnastics team that recently took home the 2008 National Collegiate Athletic Association (NCAA) championships. Grace is also the 2008 NCAA balance beam champion. 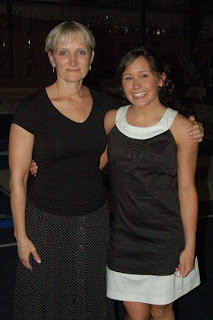 In the photo at left, Grace (right) stands with her former coach and friend Draha Kriz, the reigning South Carolina Gymnastics Coach of the Year and an Olympian that competed in the 1976 games. A famous Aiken Gymnastics alum graced the AIGY gym Saturday, and whomever said that “you can never go home again” never knew of Grace Taylor. Taylor, a member of the NCAA gymnastics championship team and the 2008 NCAA balance beam champion, served as a judge for the AIGY May recital Saturday. Taylor also presented awards to the competitive teams that won at the state and regional meets.